Hi Lil’ Luna readers!! I could not be more excited to be here! 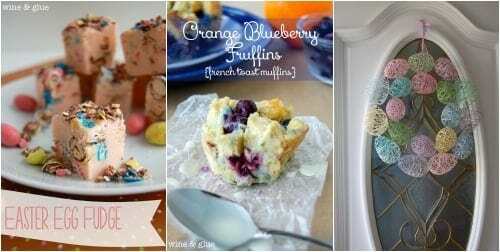 My name is Lisa and I blog over at Wine & Glue all about the life of a wannabe baker, chef, seamstress, and crafter. I’m also a very real mom kept busy by my six and two year old and excitedly expecting another kiddo in May. Raise your hand if you are as obsessed with cookie dough as I am! When I was pregnant with my first, I made cookies all the time (like at least a batch a week) just for the excuse to sneak a nibble or two of cookie dough! 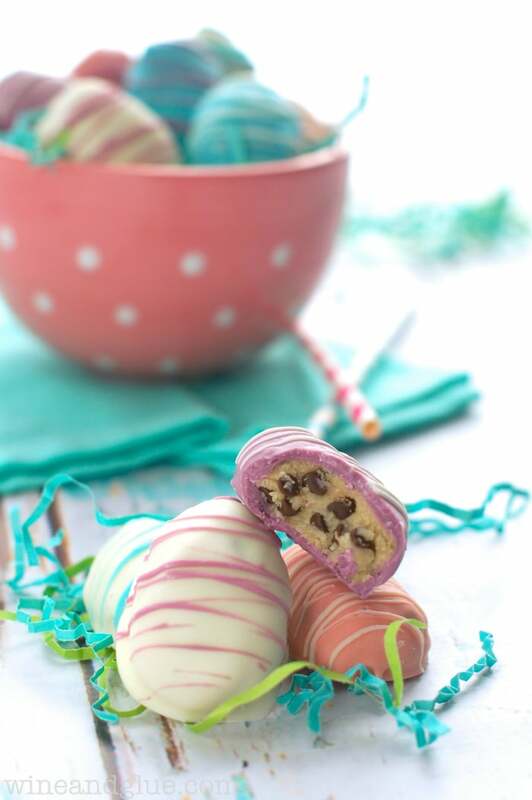 So you can imagine how nuts I am about these Easter Egg Cookie Dough Truffles! One of things I feel really strongly about on my blog is the fact that I’m not an expert. (I wear my wannabe badge proudly!) So if you see something on my blog, you can feel confident that if I can do it, so can you! Same thing goes for these truffles! I know that dipping truffles can seem really tricky and intimidating, but these are so easy. They stay together perfectly, and they dip beautifully. And the lines on top are just created by thinning the chocolate with a little bit of vegetable shortening, and then drizzling with a fork. Annnnnnnd, I have a fun little extra treat to go along with these delicious little nuggets of amazingness. 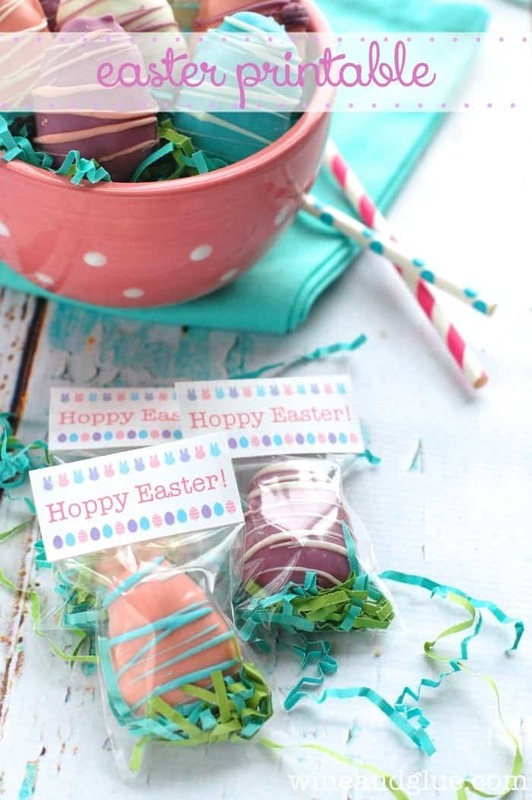 A cute little printable that you can use to bag them up! People will think that you bought these fancy treats at a bakery 🙂 You can head over to Wine & Glue to get the printable. 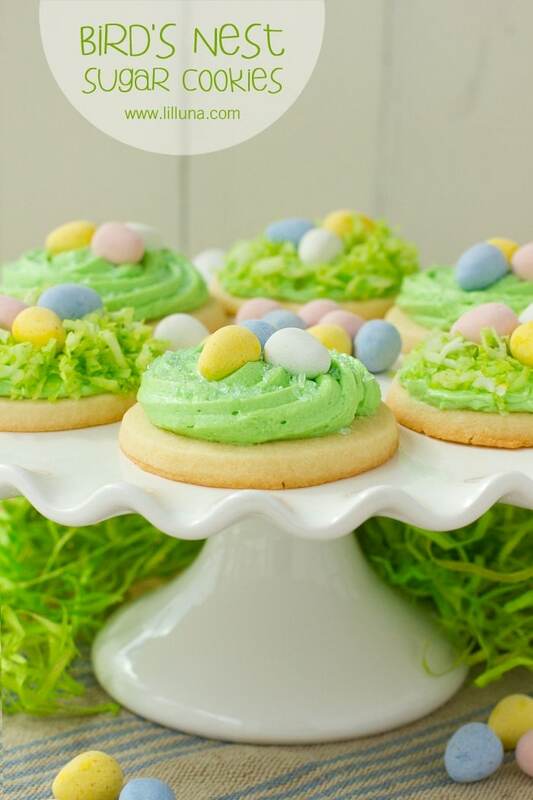 Want more spring and Easter ideas? 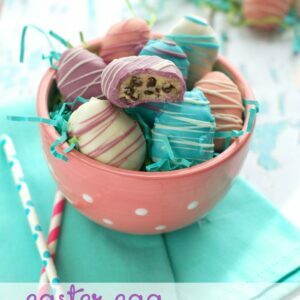 Easter Egg Cookie Dough Truffles - CUTE! 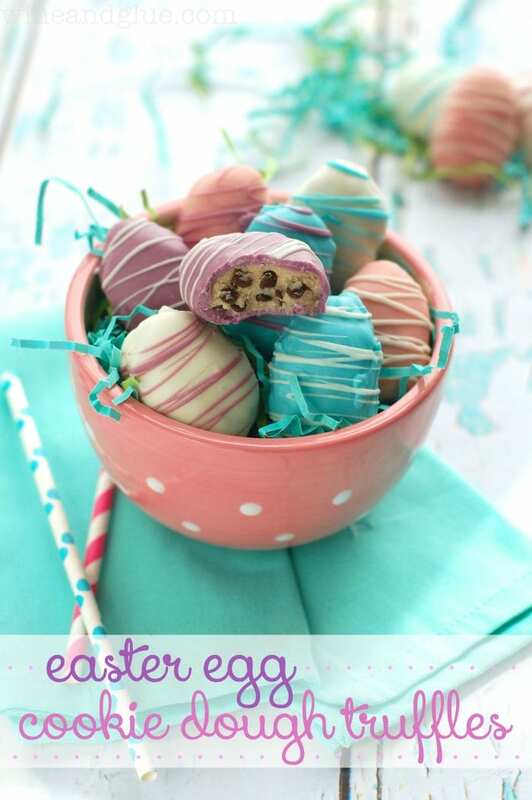 Delicious egg-less cookie dough dipped in melted candy coating!! So cute! Thanks for having me Lil’ Luna!! 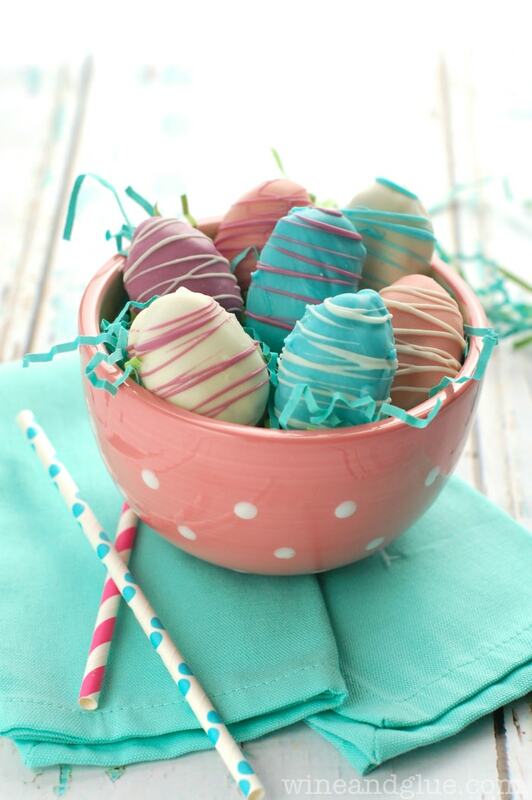 Not only do these look beautiful but they look delicious too!! For more great projects and creations from her, please head to her site: Wine and Glue. these are soo cute!!! and look so yummy! Love the colors! Looks tasty! These look so good!! I love anything with cookie dough -YUM! 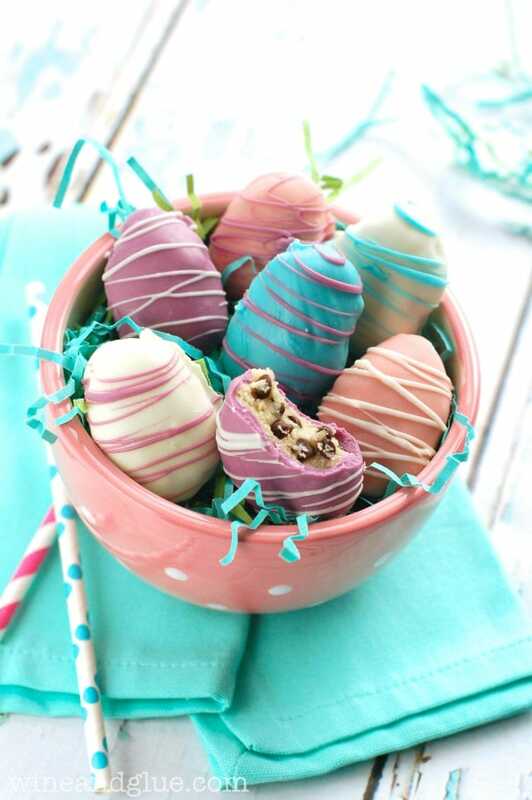 These look adorable and so yummy! I have a question though, do these need to be kept refrigerated once they are completed? 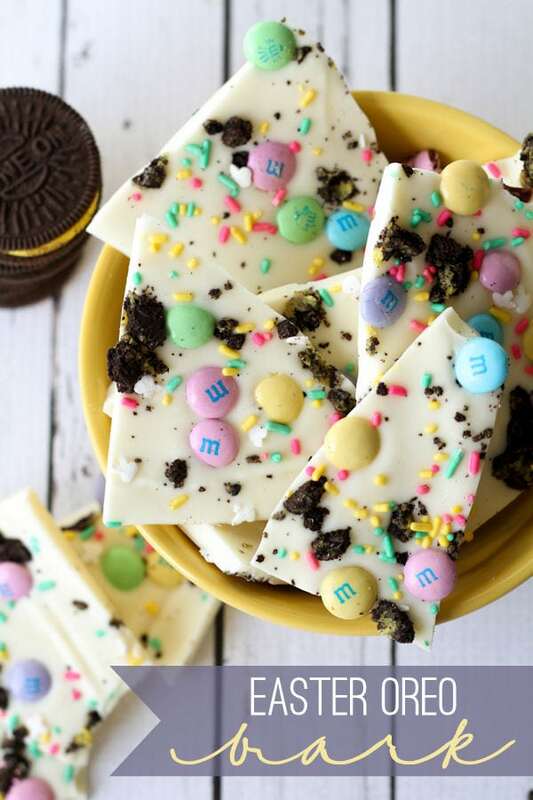 This may be a dumb question, buy what are candy melts? Same thing as almond bark? Can this be made with regular milk instead of sweetened condensed milk? When I’m making eggless cookie dough, that’s how I usually do it. I just feel like the sweetened condensed milk might make it too sweet. These look awesome, thanks for sharing! How many do these usually make? I would like to make these for Sunday, a couple days ahead of time. Once decorated, do you recommend refrigerating until ready to serve? Thanks! How far in advance can you make your truffles and after dipping them and decorating, do you need to put them back in the refrigerator? Please let me know as soon as possible. I need to begin ASAP. Your quick response will be greatly appreciated. So, sorry to not have gotten back to you sooner. I was out of town. But, you could make them the night before or the morning of and I would put them in the fridge. Hope that helps. Thank you!